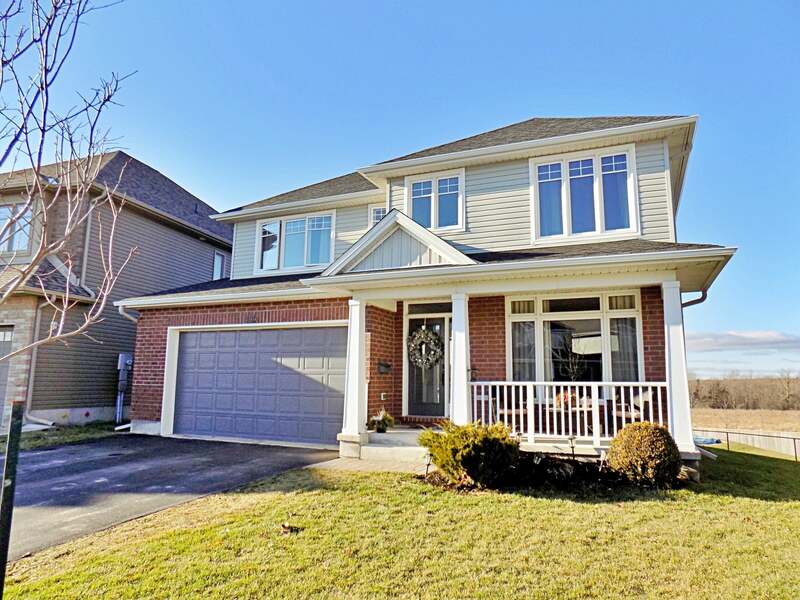 Stylish two storey home on a quiet crescent w/over 3,770 sq/ft of finished living space! Featuring 4+1 bedrooms, 3.5 baths, walkout basement, huge pie-shaped lot and in-ground pool. This exceptional home offers two storey grand foyer w/hardwood/tile flooring throughout the main level. Formal living & dining rooms, main floor office, great room with soaring 18’ ceilings, floor-to-ceiling stone fireplace & automatic retractable shades. Stunning custom maple kitchen w/granite counters, oversized island w/two sided extended breakfast bar, tile backsplash & butlers pantry. A beautiful open staircase leads to 4 spacious bedrooms including the master w/walk-in closet & 5-piece luxury ensuite w/roman oval soaker tub, separate shower w/glass doors and double sinks. Large 2nd floor laundry room and 4-piece main bath. Fully finished walkout basement offers extra large windows, 5th bedroom, 3-piece bathroom w/custom tile shower, wet bar, movie-room with retractable screen plus huge separate rec room w/pot lighting, fireplace and garden doors to an entertainers dream backyard complete w/gorgeous 25ft x 37ft in-ground pool, large concrete patio and ample backyard space for the kids. Six appliances included, central air, HRV, enlarged garage width & much more! An absolutely incredible home, close to all west end amenities! Floor Area 2,738 Sq. Ft. Lot Size 35.69 x 153.08 Sq. Ft. Please send me more information on 1166 Escala Crescent, Ontario. Thank you.